This pastoral region is home to Rome, the capital of Italy, and much of its countryside remains as it must have been in the days of the Empire: quiet, dotted with sheep, the domain of farmers and shepherds who make a living in its hills and valleys. 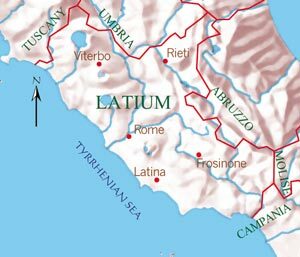 In Latium, lamb and pork are standard fare, and sheep's milk cheese is produced abundantly in small dairies and large cooperatives. Simple pastas made of flour and water and a wealth of vegetables round out the Roman larder. Amatriciana is usually paired with bucatini (hollow spaghetti) in Rome, but it marries beautifully with spaghetti as well. Guanciale is made from the meat of the cheek and throat of a pig. The meat is salted, rubbed with pepper, and aged; less fatty than Pancetta, which is made from the belly of a pig, it is cooked in pasta sauces, with vegetables, and more. You will find Guanciale at specialty markets that import cured meats from Italy. Heat 2 tablespoons of the olive oil in a heavy saucepan over a medium flame and add the Guanciale, onion, garlic, and chili. Cook until the Guanciale releases its fat, about 10 minutes, being careful not to brown it. Add the tomatoes and ½ teaspoon of the salt, bring to a boil, and cook until the sauce reduces somewhat, about 20 minutes, stirring often. Meanwhile, bring 5 quarts of water to a boil. Add the spaghetti and the remaining 2 tablespoons of salt and cook until al dente; drain, reserving 1 cup of the pasta cooking water. Toss the spaghetti with the sauce, the reserved pasta cooking water, the remaining 2 tablespoons of olive oil, and ½ cup of the Pecorino, and sauté for 2 minutes. Making fresh pasta is not at all difficult, and it's extremely gratifying. I love making all sorts of fresh pasta at home; some of the doughs I make use only all-purpose flour and eggs, others only semolina flour and water, and others still buckwheat flour, rye, or other grains. I also love combining all-purpose flour with semolina flour and eggs to create a deliciously rustic, toothsome pasta, like in the recipe below. Below is a versatile recipe for fresh rigatoni made with half all-purpose flour (I use King Arthur Unbleached All-Purpose Flour) and half semolina flour, plus eggs. 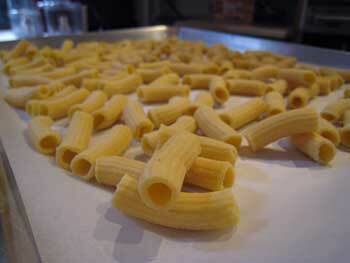 Once the rigatoni are shaped, they can be dried, frozen, or cooked immediately. I use a handy machine called the Marcato Atlas Regina Pasta Extruder I ordered from a great online source, Fantes, to shape the rigatoni easily. 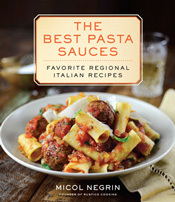 The raw ingredients for homemade rigatoni are: Unbleached all-purpose flour; semolina flour; and eggs. 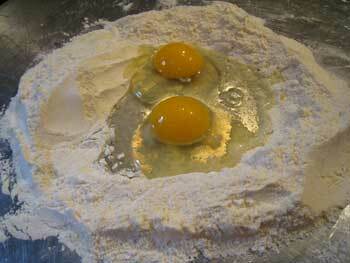 The standard formula used by most Italian cooks is 3 and 1/2 ounces of flour in all per egg. However, some recipes call for more or less eggs; no eggs at all; only egg yolks; a hint of white wine; or olive oil to be added to the dough instead. All of these variations yield different textures of pasta; the fun is in experimenting once you have mastered the basic technique of combining wet and dry ingredients and rolling out and cutting the resulting dough. The extruding machine yields a better pasta when the dough is pretty firm, rather than soft, so in this case, I use 1 egg for every 4 and 1/2 ounces of flour total instead. 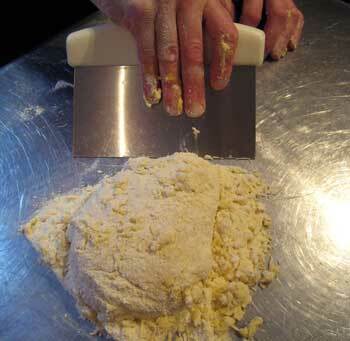 Place the all-purpose flour and semolina flour on a counter and combine with your hands until thoroughly mixed. Make a well in the center and crack the eggs right into the well. You can use a fork to beat the eggs if you like, or simply use your fingertips like I do to mix the eggs into a nice frothy mess. 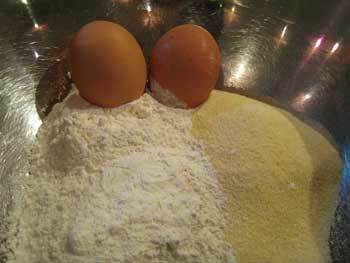 Then start drawing in the flour from the edges of the well, little by little, until the eggs become a thick slurry. It will be a bit messy and may seem sticky at first, but as you draw in more flour, the dough will start to come together and form a shaggy mass. It will gather around your hands. 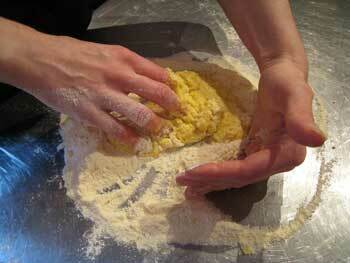 When almost all of the flour has been incorporated into the eggs, begin kneading the dough by hand. The goal is to incorporate all the flour into the eggs, so don't stop just when it seems the dough has come together; remember, this has to be a firm dough, so if it is sticky, it will be a problem later on. 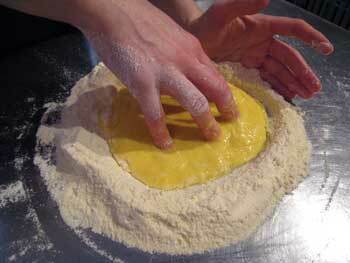 Alternately, place the all-purpose flour and semolina flour in a bowl, make a well in the center, and add the eggs to the well. Work the eggs into the flour in the bowl, then turn the resulting dough out onto the counter and knead it as above; this method may be easier for beginners. Use all the strength you have in your hands; this is a rather firm dough, nothing like bread dough; it is quite dry, and needs to be pushed, compressed, turned so that the all-purpose and semolina flours absorb the eggs and the resulting dough becomes smooth and supple. At this point, you can let the dough rest for about 30 minutes, covered with a towel, or you can shape it immediately. The extruding machine is going to do the work for you in this case, so a rest is not needed. 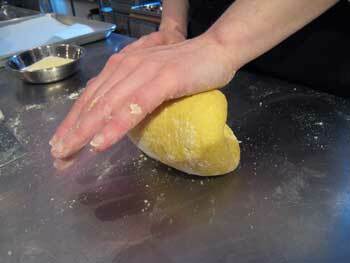 Using your hands, roll the dough into a thin, long log. The log should be about a 1 and 1/2 inches wide. Using your handy dough scraper, or a paring knife, cut into 1 and 1/2-inch-long pieces. Set up the pasta extruder on a counter. Be sure to keep the dough covered while you set up the pasta extruder so it does not start to dry out and crack. 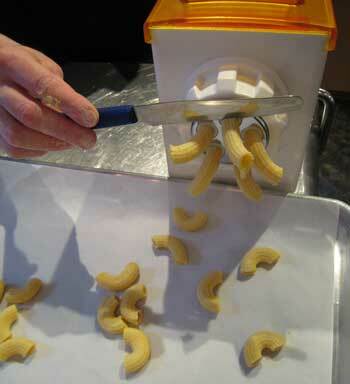 Set up a tray lined with parchment paper directly under the pasta extruder to catch the rigatoni as they are shaped. Now you're ready to start cranking: this is really fun, but it does require a bit of strength: remember, the dough is firm. Feed one piece of dough into the opening at the top of the extruder, and at the same time, crank the handle. You will see long, tubular pasta emerge. This is the rigatoni. Cut the rigatoni into pieces of the appropriate length using a very sharp knife with a decisive downward motion to avoid ragged edges. I cut my rigatoni about 1 and 1/2 inches long (you can make yours longer or shorter, as you prefer). Don't fret if some of the rigatoni curl as they come out of extruder: that's OK. This is homemade pasta and it's not meant to look like it came out of a box; a little variation is acceptable and charming. When all of the dough has been used, you will have quite a bit of rigatoni. You can cook the rigatoni right away (that's what I prefer to do, because the texture of freshly made pasta is unrivaled), or you can dry out your rigatoni and store them for later use. You can even freeze them if you like. To dry rigatoni, set the tray aside at room temperature in a well-ventilated area and let rest, uncovered, until the rigatoni are fully dry, about 24 hours. Then place in an airtight container and store at room temperature like you would store-bought pasta. To freeze the rigatoni, place the tray in the freezer. When the rigatoni are frozen solid, after about 2 hours, place them in freezer-safe plastic bags and freeze for up to 1 month; do not defrost before adding the rigatoni to boiling water. 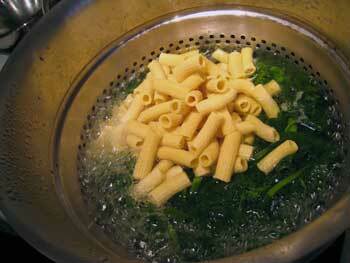 To cook the rigatoni, fill a large pot with an insert colander with 6 quarts of water and bring to a boil. If you can't get your hands on broccoli raab in your area, try using 2 large bunches of broccoli instead; it will be good, though not quite as full of personality, or as silky in texture, because the broccoli raab breaks down into a lovely mass when it is cooked down a while. Add the salt to the pot of boiling water. Drop in the broccoli raab and cover the pot. 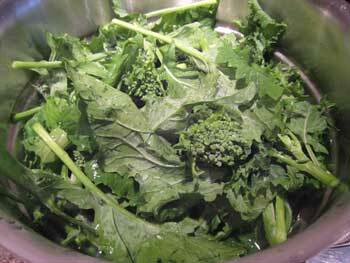 Cook the broccoli raab until the water returns to a boil, about 5 minutes, stirring once in a while. Add the rigatoni and stir well. Cook at a vigorous boil until the rigatoni are al dente, about 5 minutes. The rigatoni will not be done as soon as they float to the surface of the boiling water, like tagliatelle and other delicate handmade fresh pastas; they are fairly thick and need a few minutes to cook through. Drain the rigatoni and broccoli raab and reserve the pasta cooking water. 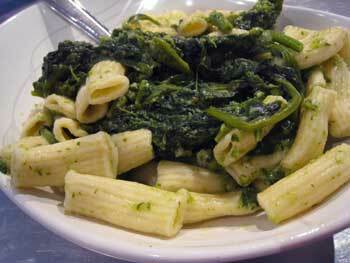 Place the rigatoni and broccoli raab in a deep serving platter. A little cooking water clinging is a good thing, since the only other liquid you'll be adding at this point is some olive oil infused with garlic and chili. Prepare the infused olive oil. Place 2 tablespoons of the olive oil with the garlic and chili in a small skillet and warm gently to release the aroma from the garlic and chili. Do not heat too much, or the garlic may burn and the chili will take on a bitter taste. This infused olive oil is wonderful with all kinds of pasta, and makes up the basic aglio, olio, e peperoncino (garlic, olive oil, and chili sauce) that is so common as a sauce for pasta across central Italy. If you prefer a milder garlic taste, simply use 1 crushed garlic clove instead of the minced garlic, and discard the garlic clove after you've warmed the olive oil with it. Pour the infused olive oil over the rigatoni and broccoli raab in the serving platter. Toss vigorously to coat the rigatoni with the infused olive oil. Add the remaining 1/4 cup of olive oil, the Pecorino, and as much of the reserved pasta cooking water as needed to create a pasta with a fluid, slippery texture. 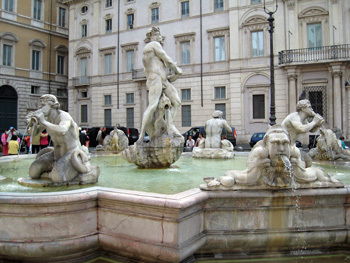 This seductive appetizer is a specialty of Rome. 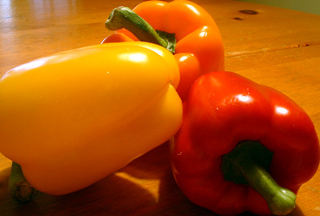 The recipe was requested by a newsletter reader from New York City. Thread the cubed Mozzarella and bread on each of 8 skewers, alternating them and starting and ending each skewer with bread. Place on a roasting rack set in a roasting pan and bake until the Mozzarella melts but still holds its shape, about 10 minutes, brushing both the bread and the Mozzarella with 2 tablespoons of the melted butter during baking. Meanwhile, cook the anchovies in the remaining 6 tablespoons of melted butter until dissolved; do this over a very low heat or the anchovies will burn. Add the milk, whisk to comibine, and keep the sauce warm. 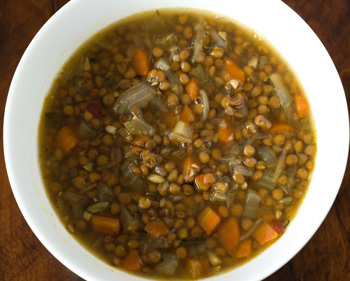 In Italy, lentils are standard offerings on New Year’s tables as a symbol of luck and prosperity (their round shape is thought to be reminiscent of coins) as well as the building block for a number of delicious winter soups. The soup below features tiny lentils from the town of Castelluccio in Umbria: their thin, delicate skin and sweet, nutty flavor (not to mention propensity for cooking up firm) makes them one of Italy's most prized legumes. Even though they are favored in Italy on New Year's tables, you can enjoy these succulent lentils year-round. Rinse the lentils, pick them over, and place in a 2 quart pot with the broth. Bring to a boil and cook over medium heat 30 minutes, or until almost tender. Heat 1 tablespoon of the olive oil in a 3-quart pot and add the onion, carrot, celery, parsley, and thyme. Cook 10 minutes over medium-high heat, then add the tomato paste. Pour in the lentils and their broth, bring to a boil, and simmer, covered, 30 minutes, or until the lentils are cooked, adding a little more broth if needed to thin out the soup. Season with the salt. Meanwhile, heat a grill pan over high heat for 5 minutes and toast the bread until lightly browned on both sides, turning once, about 2 minutes per side. Rub the bread lightly with the garlic. Ground beef and veal mingle in this rustic ragù. Adding a touch of raw garlic and parsley at the end enlivens the dish and provides a fresh note. Heat 1 tablespoon of the olive oil in a 12-inch sauté pan over a medium flame. 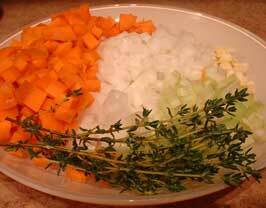 Add the onion, carrot, celery, thyme, and ¼ teaspoon of the pepper and cook 10 minutes, or until the vegetables are soft. Add the veal and beef and cook 20 minutes, stirring once in a while, or just until the meats brown and take on a deep aroma. Add the tomato paste and the wine and cook 5 minutes, or until the wine evaporates, scraping the bottom of the pan with a wooden spoon to dislodge any clinging bits into the sauce. Add the cloves, broth, and 1/2 teaspoon of the salt. Cover and cook for 1 hour, or until the meats are very tender, stirring once in a while and adding a little broth if needed. 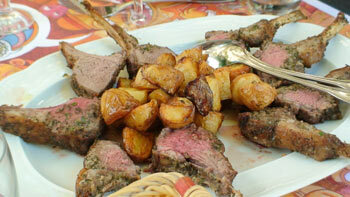 Toss the lamb chops with the garlic, black pepper, rosemary, and olive oil in a shallow container. Refrigerate for 2 to 24 hours. Heat a grill pan over a high flame for 3 minutes. Add as many lamb chops as will fit in a single layer, season with some of the salt, and cook 3 minutes, or until browned on the bottom. Turn and cook 2 more minutes, or until browned on the other side. The lamb should still be rosy inside. Remove to a warm serving platter and cover with aluminum foil (you can keep the lamb chops warm in a preheated 200°F oven if you prefer). This unusual chicken dish brings to mind the cooking of Classical Rome, where the sweet and the savory often mingled. Place the chicken in a large ovenproof dish. Mix all the remaining ingredients together except the salt, and pour over the chicken. 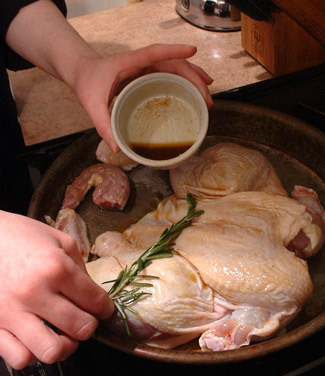 Allow the chicken to marinate for 24 to 72 hours, covered, in the refrigerator, turning once in a while. When you are ready to serve, preheat the oven to 450°. This is a delicious Roman adaptation of the classic Italian peperonata: chunks of sweet peppers cooked with onions, tomatoes, garlic, and a hint of anchovies until they are silky soft. 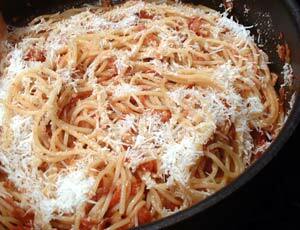 It makes a one-dish meal with crusty bread and a hunk of sharp Pecorino Romano. 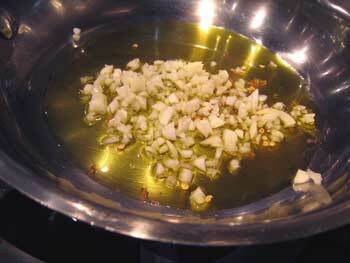 Heat the olive oil with the garlic, anchovies, and chili in a 3-quart sauté pan over a medium flame. Cook for 1 minute, or just until the garlic releases its aroma. Stir in the peppers and onion and cook for 15 minutes, stirring often.